Why do you need to place Banner Advertisements? 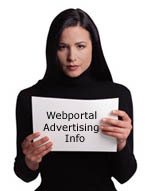 By advertising with Webportal.com.my, you will be able to promote your product in the shortest time ever! By subscribing for multiple exposures, you will be able to drill into our visitors' head and make them remember your Brand Name, Website Name or whatever message you are trying to convey to others. Reach a worldwide audience at a minimal cost. Banner advertisements are one of the cheapest form of advertising you are able to find in the media world today. Apart from it being only a fraction of the cost as compared to other mediums, you are also able to reach a wider worldwide audience when placing Banner Advertisements rather than restrict yourself to certain locations or markets. Webportal.com.my can help bring customers directly to your website via our Banner Placements. Users will only need to click on the banner to be automatically transported to your Website where you will then have full control as to what product or message you wish to present. No other form of advertising can deliver potential customers to your store so easily. Comprehensive demographics allow for the promotion of most products and services. Webportal.com.my has a massive amount of traffic as well as a wide range of demographics. Our visitors range from students, to income earners all the way down to retired senior citizens. Whichever market or product you are trying to push & sell, Webportal.com.my will be able to put your message forward to your potential untapped customers. Target Advertising becomes a reality! Even with though our visitors consist of a wide range of demographics, we are able to target via email promotions certain sections of our members/visitors. Also by placing banner advertisements strategically, we can help advertisers target their audience effectively without wasting any money on non-performing advertisements. Track exactly how effective your ads have been. Banner Advertisements placed on Webportal.com.my can be tracked down to the finest detail as to how they are performing. Our special banner account console allows our advertisers to see how many people have seen their advertisements and how many people have taken action by clicking on them. This enables advertisers to analyse and see how effective their banners or advertising policies are.